sometimes anniversaries get a little wild! after my amazing trip to “shop-til-you-drop-and-be-the-only-one-in-the-store” trip to michael’s arts and crafts yesterday, we came home and worked for a few hours. when it hit around 5:37pm…the hankering for an anniversary margarita kicked in and we headed out to pappasito’s tex-mex, thanks to a gift card from my sister-in-law-thanks ash! we decided we should go big and experience the “table side guacamole,” which turned out to be an excellent decision. when i asked the woman how she felt if we took her picture, she responded with, “oh i don’t mind at all, every loves to take a picture of this process. i’m pretty much guacamole famous.” amazing. and true. it’s also true that i LOVE chips, the crunching calms me and i’ve been known to eat entire baskets/bags/whatever form in one sitting. look at that beautiful guacamole! we especially loved it because it contained NO purple/red onions-ew. we both despise those so not having them added was phenomenal. so much guac that we both enjoyed some today with lunch. dinner tasted great, although my margaita took entirely too long to get there so i was a little crabby by then and had put my camera away. i may have also downed it in about 4 sips so there was nothing to see anyways. the beautiful texas sunset made up for it as we left the restaurant to indulge in the rest of our highly romantic evening. ravery has never seen what happens when you put mentos mints into a 2 liter of pop?! i feel like this is a rite of passage as a child so after i heard that-we obviously had to get some. it comes with the red inserter thing so maybe you will have less of a risk of them shooting into your eye sockets. i will get back to you on this because we forgot to get pop on our way home. i spent a lot of time convincing ravery to NOT make me into a clown or an old man so he opted for a ferocious tiger! i am highly impressed with his skills. and here’s a little tip for you if you do this….YOU ARE SUPPOSED TO ADD WATER TO THE PAINT! my face felt raw for the first few minutes of him trying to get the paint to spread-it was terrible. then the very smart and planner wife, chelsea, read the directions, which said to add water. way better. what do you think? freakin’ hilarious and weird?! me too. my trusting husband said i could surprise him and paint whatever i wanted on his face. hmmmm what to do, what to do? at the time, i mostly thought i was too damn funny for my own good and now that i’m looking at this picture…i kinda feel like i took advantage of him. is hello kitty too much? probably. he was not the happiest with my choice but good thing he can laugh at himself and doesn’t get angry! **please do not use these pictures to blackmail us in the future because then we won’t be friends and i will find you because of my increased sense of tiger smell. the new wifestyle: celebrate (or don’t celebrate) your anniversary however you darn well please! 1) do you say soda or pop? 2) face painting…sometimes cute or always creepy? 3) if we painted your face…what would you pick? ← Previous Story best anniversary ever! Next Story → …and we are off to RUSSIA! 2) Sometimes cute. I like to make it intentionally creepy. No matter what’s on your face, if you go dead in the eyes and breathe out of your mouth, its scary. soda person, eh? okaaaay. and hilarious observation that dead in the eyes and breathe out of mouth=terrifying. highly accurate heather! and you would totally rock the alien look! Oh and Miss Aiden wants you to paint her face like hello kitty, lol. I told her I could try because you are gonna be super busy for awhile! haha thanks for stepping in while i’m a bit busy (and in a different place). hello kitty wasn’t actually too hard to do! i hope to see pictures of miss aiden! Great blog entry. Terry and I too love Pappasito’s, they have great fajitas and, of course, margaritas. 2. I’ve never had my face painted, but I love seeing the kids at festivals getting their faces painted very creatively. So it’s cute! 3. If I’d get my face painted, I’d definitely be a bear! thanks for reading AND commenting-chuckmen! they really do have great fajitas-though a tad on the pricey side but when it’s a splurge it’s worth it! hah love the bear idea for your face painting-it would be amazing! Well Chelsea Avery, this is where you and I part ways. I don’t think I can be friends with someone who doesn’t like red onions. And all this time I thought we were SO ALIKE. 1 POP for cryin’ out loud!!!!!! 2. I love face painting especially when someone is really good at it- never had it done but my daughter loves it. Can’t BELIEVE you made Ryan into hello Kitty. You are a wicked woman after my own heart. Ryan did a pretty damned good job on you though! jeeeeeeez paula! that stinks. it stinks like people’s breath after eating red onions that sticks with you for days. ew. although there is something redeeming about that we both say “pop!” i know, i feel kinda bad about the hello kitty but a little bit awesome too 🙂 he rocked mine…he’s artsy like that! and ohhhh sparkly butterfly with tons of glitter would be excellent! compromise: I won’t eat red onions around YOU. p.s. did you know that they LOVE red onions in Russia?????? 3) I’m quite liking the tiger one to be honest. Either that or something to do with big cats. yaaaaay another one for POP! thank you for being impressed with our face painting skills…we both wanted another shot at it after “getting a feel for it” but it was already 10:30pm and that is about 30 minutes past our bed time. you would look FIERCE with a tiger face. please find someone to paint it on you! I say “pop”… but only by accident. I WANT to say “soda”. I GREW UP saying “soda”. …but these mid-westerners got the better of me. 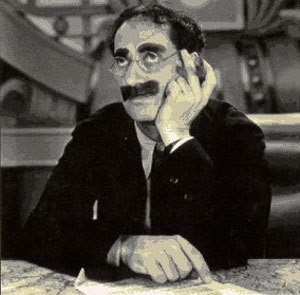 Groucho Marx. Didn’t even have to think about it!